Can you use a Gorilla pad with an expandable liner? Hi Brandon. It can be done but I would not do it. It is so hard to keep the Gorilla pad from getting wrinkled and bunched up. The best material for a base on pools with deep ends is moist masonry sand. If the dirt is smooth and damp, and the sand is slightly wet, the sand will stick to the slopes and allow you to smooth it to a nice finish. This works well when you plan to stretch the liner into place. Check these pages for a few ideas about the best ways to install expandable liners. Should you put a pool liner pad down when putting in a Expandable Liner? Hi. I wouldn't do it, it's just to hard to get the wrinkles out. I would just use sand. What kind of pad is best to use for an expandable liner of a above ground pool? Hi. I don't recommend any type of pool pads for expandable liners. There is nothing on the market that I know of that will lie flat, without bunching up, in a deep area. I have seen people cut and tape until the pad is flat, but this can be very time consuming. I shape the deep end and water it until it is moist. I then spread mortar sand on it. I smooth the sand once and then water it until very damp. I then finish the smoothing with a combination of a couple of brooms. Just before I install the liner I dampen the area again. All my liners are stretched into place so footprints are not a problem. Keep in mind when working with a pool pad that they are very thin. Anything underneath the pad will show through once you have water in the pool. If you use sand under the pad you will create footprints as you install it. These footprints will show up big time once you install the liner. The only time I recommend pool pads is for a pool being installed on concrete. Or one being installed indoors on tile. In those situations the pool pad work perfect. I'm excavating for a 24' AG pool. I'd like a foam base, but I'd also like to dig the center 6" or a foot deeper (as in attached picture). Any experience using 1" foam with a deep center? I'm not sure how it will work around the corners, contours, etc. and whether the liner will wrinkle. Hi Jeff. It is not something I would try. 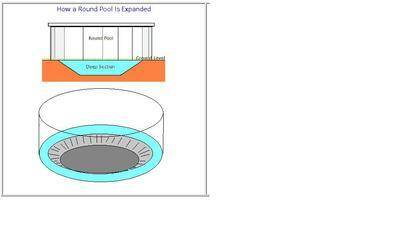 I would use a sand base and stretch the liner into place from outside the pool, as shown on this page. I saw a U-tube video awhile back showing a crew using form on an oval deep end. They cut the foam into a lot of pieces and held it all together with duct tape. It just seemed nearly impossible to me to come out with something nice in the end. Like you said, just to many angles and edges. A nicely formed sand base is just perfect for expandable liners, at least that is the way I see it. 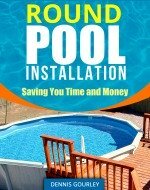 I had a 27' round pool with half sloping to 7'. The expandable liner was horrid. There was nothing expandable about it. There was so much extra vinyl that I had "wrinkles" of a foot or more. It had a seam at the bottom of the wall so the extra vinyl couldn't be pulled up over the wall. It looks like those in your picture that have no seam at the bottom of the wall. Is this correct? I am replacing with a 28' pool and do not want the same unsightly mess again. What do I look for to get a liner that is like your pictures? Hi The only liners I will install in a deep area are the Doughboy brand expandable liners. All liners have a seam around the bottom of the side panel. This seam should fall somewhere in the cove area but where it lies is not an important factor. Getting the liner in smoothly is far more important.